Please note that all of this information is intended to just give you guidance on what to wear. You need to feel comfortable with whatever you decide to wear. Feel free to do some online searching and look for outfit examples for each category from the national, state, or local pageants. Interested in wearing something new-to-you without spending a ton? There are many pageant contestants who re-sell their wardrobes. Check out http://pageantresale.com/ or RENT one from the Miss Onalaska Organization. All outfits will need to be approved in person at a practice. Approvals for outfits will NOT be granted through pictures. If there is no midriff, not too low of a cut, and any slits are appropriate, it is typically fine, but final decision is up to the Pageant Director in coordination with Sparta Festivals Inc. It is also important to remember to BE YOURSELF. Judges only see you for about 15 minutes total and there are different judges every year. Don't copy the outfits, songs, etc. of former titleholders....It wasn't the dress or the song that made them win, it was that they were unique, themselves, and the total package. Remember that a portion of the competition takes place behind closed doors, and don't get too caught up on one area of the competition over another. Leave an impression that is YOU. It is recommended that contestants wear a dress for the interview portion of the competition. Usually these are worn without jackets. Many contestants choose solids, but the color/pattern is up to your personal preference. It is also important to consider what jewelry is appropriate with your outfit. Try some awesome (and big!) earrings. For shoes, heels are recommended. The most important thing to remember is you want the judges to be focused on you. Not your outfit. Avoid distracting outfits, and make sure that whatever you wear is comfortable for you. If it's not comfortable, you'll end up tugging at it, or adjusting it during the interview. You want to feel calm, cool and confident throughout your interview - choose an outfit that makes you feel sophisticated and ready to take on the world. Be sure to choose an outfit that compliments your talent. For anything from a classical opera to a popular song, it is recommended that you wear some sort of formal gown. If you're doing a themed piece and/or musical theater, it is best to use your outfit to convey your character. Outfit to compliment the style of your dance. If you're doing lyrical, something that flows well with your choreography. If you're doing tap, something that reflects the energy of the song. No matter what - be sure that you practice in your outfit so that you know it won't get caught up on you in any of your choreography. *NOTE midriffs may not be shown during the local competition. A skin colored leotard underneath is allowed. A formal gown or formal jumpsuit (these have increased in popularity over the past few years) would be fitting. 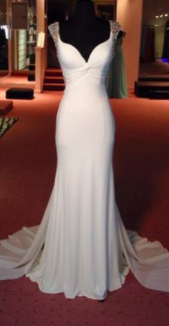 Be sure that if you're sitting, your gown doesn't have a slit that goes too high. Be sure that you practice breathing in your dress before you decide what to wear - you don't want to choose something that is too tight to get a good breath in. Fit the part! Think about the character you are trying to portray and, just like an actor in a play, use your outfit to bolster your performance. Use your outfit to help you tell your character's story and give the audience a setting to remember you by. Your outfit can be anything from scrubs (seen here on Miss Colorado, a top semi-finalist at Miss America 2016) to a long black coat (seen on Miss Puerto Rico at Miss America 2017). Be confident and play the part and no one will question a thing. Doing something else for your talent? Choose something that fits the talent! In the past we've seen cake decorators in blinged-out aprons, contestants performing in their full karate/tae kwan do outfit, or even speed-painting in a cute outfit. If you need help, don't be afraid to ask! All kinds of talents make it all the way to Miss America, so don't be afraid to try something different. Two recent Miss Americas, Kira Kazantsev and Nina Davuluri BOTH performed non-traditional talents; with Kira tapping a cup and singing Pharrell's "Happy" and Nina performing a Bollywood dance. Miss Ohio Mackenzie Bart, a ventriloquist, even made the top 16 at Miss America 2015! Be sure that your evening gown is age-appropriate. Try to avoid anything with too low of a neckline, or too high of a slit. Try and find something that flatters your figure, without being distracting. Find something that you feel absolutely stunning in. Also do some searching online, and take a look at last year's Miss America's Outstanding Teen pageant, or Miss Wisconsin's Outstanding Teen pageant. These will give you a good idea of what is out there. Wearing your prom dress for this phase of competition is perfectly acceptable at the local level. If you're interested in picking something new, we'd recommend something more pageant than prom. A sales associate at any bridal/pageant/prom store should be able to help you in this direction. If considering a new purchase, please consider our sponsor, Charlotte's Bridal and Formalwear, and mention that you're competing for Miss Sparta. It is recommended to wear heels with your evening gown, as help with posture and elegance. Stunning. That's what you're going for. Try and find something that flatters your figure, without being distracting. Find something that you feel absolutely stunning in. Something with wow factor, but won't outshine YOU! If you're interested in picking something new, we'd recommend something more pageant than prom. If considering a new purchase, please consider our sponsor, Charlotte's Bridal and Formalwear, and mention that you're competing for Miss Sparta. Also do some searching online, and take a look at last year's Miss America pageant, or Miss Wisconsin pageant. These will give you a good idea of what is out there. 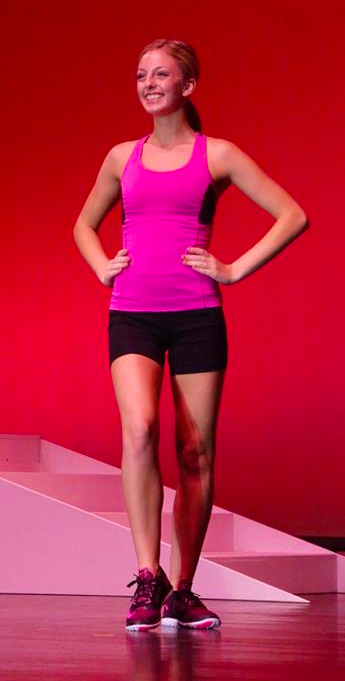 For the activewear competition, you will need a solid color tank top and black shorts. You will also need running/tennis shoes and socks. Bike shorts should fall below where your fingertips hit.